I can't believe it's the end of the week! I've been so busy so I'll be glad for the weekend to arrive... I'm a bit annoyed though because I don't get a lay in! I've got a plumber arriving at 9am (!!!!!!!!) to service the boiler. I'm not an early riser, not in the slightest. Everybody told me that would change once Caleb was born, and yes, we had nearly 9 months of getting up in the night and then up at half 7 in the morning, but now he sleeps until 10am every day, so I can still get up late every morning, which is amazing! I had planned something cooler for today's post, but I was so tired last night that I just wasn't up to it, so I thought I'd just try out and untried. Up until a couple of weeks ago, the only NYC Colors polish I owned was Lexington Yellow. And possibly a blue? I'm not 100% sure on the blue, I'll have to root through my stash. But when I was buying a black polish for Charlotte, the winner of my last giveaway, I picked up Ink Stain. It's a very dark shimmery blue. This is from their "Expert Last" range, rather than the "In a New York Minute" polishes that I usually go for. Then I thought I'd add something on top. I thought of stamping, but I was really short for time today before my son's baby music class, so I went for flakies instead. 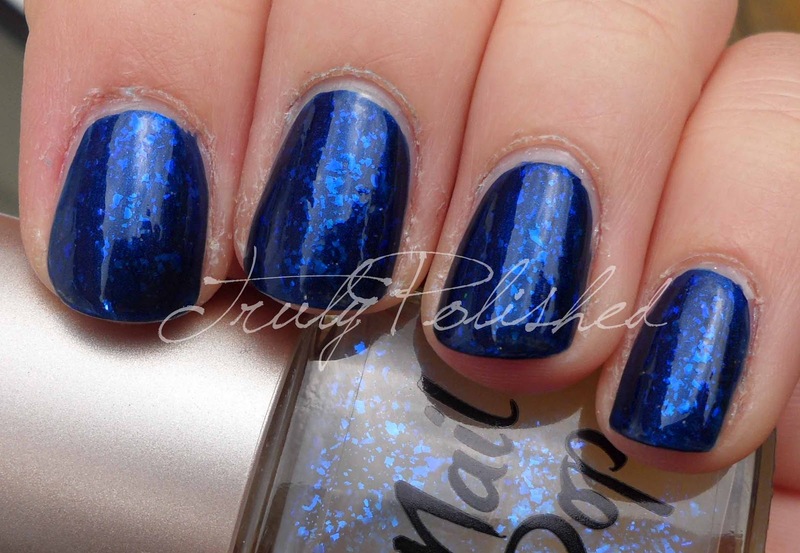 I chose Nail Pop Pearl Effect, which has dark blue flakies. It's pretty much the same as the Nails Inc Gossip Girl Serena Collection duo. I bought it from Superdrug a while ago and haven't really worn it, but I used it in my Happy Mothers' Day Franken a while ago. Overall, I'm not crazy about this combo to be honest. I love both polishes on their own, but I think I should have used a teal holo flakie or a darker base. I'm so glad I got around to using Ink Stain though, it's really similar to one of my long time favourite polishes - Collection 2000's Electric Punk. If you'd like to buy either of these polishes, NYC Ink Stain retails at £2.49, and Nail Pop Pearl Effect for £5, both are available at Superdrug.